You are invited to the 17th Annual Northern Stars Ball on Saturday, October 15th, to support the work of the Anoka-Hennepin Education Foundation. Students from the Champlin Park High School choir, band, and orchestra program will provide the evening's entertainment, culminating in a repeat performance of Ovation 2011: Primetime Live — back by popular demand! This fun evening out will showcase some of the area's best students and offer you a chance to support the great programs available to them. The evening will include a silent auction, live auction, dinner, and amazing entertainment! 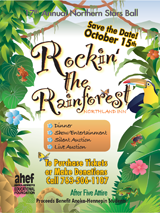 Call the Anoka Hennepin Education Foundation today at 763-506-1107 to reserve your ticket! Concert Choir members need to meet at the Northland Inn's Grand Ballroom promptly at 6:15pm for warmups and rehearsal. The Concert Choir will perform during the gala dinner along with Champlin Park's Chamber Orchestra. Click here for directions.